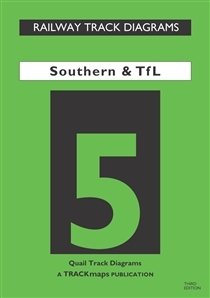 Book 5; Southern & TfL covers the area of Network Rail’s three South East Routes, the Overground, Underground, Docklands Light Railway and Tramlink, all controlled by Transport for London and a number of Heritage and leisure lines. It includes the Channel Tunnel Rail Link and Eurotunnel in their entirety from St Pancras to Calais. Now in 3rd edition (the first having been published in 1994).